Not anymore. Now, the news coverage tells it exactly as it is: a full-scale, lethal battle is being waged on the streets of Bangkok. For the first time, I am genuinely worried. Yes, the combat zone is clearly defined, and therefore easily avoided, but that’s not to say violence won’t spread. Every day comes news of a fresh flashpoint area, or a further fortified protest site, or another bomb attack. Where is safe today may not be safe tomorrow. Yes, the fighting is between protesters and the soldiers attempting to disperse them, but that’s not to say innocents have not been hurt. They have been, including members of my profession. Bombs and grenades have been fired at hotels and trains. None of my immediate friends or colleagues have been hurt, although a friend of a friend has been shot in the leg. One friend lives in Sala Daeng, pretty much “ground central” in the conflict, and spoke to me two nights ago at the same time as bursts of automatic gun fire rang out from a neighbouring street and a blast left his whole house shaking. Another friend lives in nearby Chit Lom, where the electricty has been cut and the air filled with smoke from burning tyres. They have both moved out, at least for now. Many businesses, including hotels and schools, have temporarily closed. People who do not have to go to work are taking their families to the countryside. Unfortunately, as a member of the media, I must stay. As a measure of reassurance, where I live – Phahon Yothin – is fine. There has been no trouble there in as long as the protests have been going on. The road where my office is situated is also unaffected, although access to it used to typically be via Rama IV Road, a major arterial road on which there is now a running battle and is therefore closed for a long stretch. I go to work by taxi (the entire subway and skytrain networks are closed), taking the tollway over Rama IV and exiting further south, near the port, and heading to the office from there. It’s more expensive commuting this way, but it’s safe. And while the newspaper must still go out every day, the management has told staff that they don’t have to come to work if it is unsafe to do so. I am a professional and yes, it is safe for me to attend, but for those concerned about me, let me assure you that I will not be taking any risks if that changes. Only a week ago, we seemed on the verge of resolving the deadlock. Prime Minister Abhisit Vejjajiva had announced a roadmap to reconciliation, including details of a November election and September dissolution of parliament. 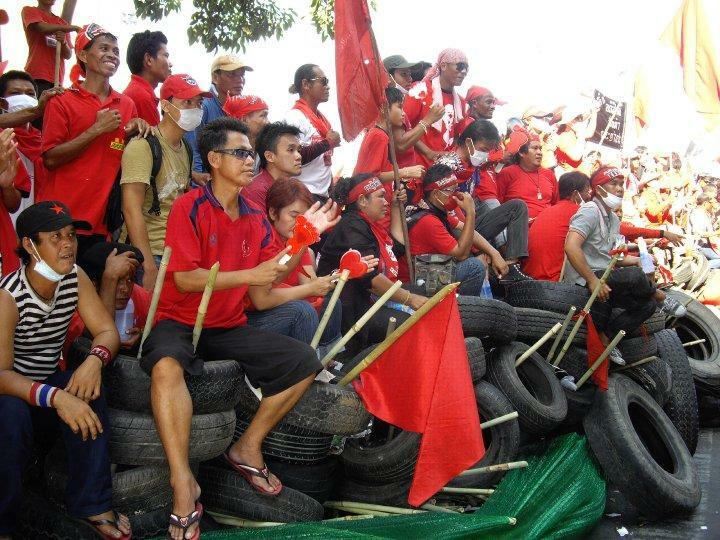 The Red Shirts provisionally agreed, yet they did not disperse their rally by last Wednesday’s deadline. A few dissenting voices, led by head of security Major General Khattiya Sawasdipol, wanted an immediate election and vowed the protest would continue until they got their wish. Maj Gen Khattiya – known popularly as “Seh Daeng” (“Commander Red”) – was then shot in the head by a sniper as he spoke to foreign press on Thursday night and chaos has reigned ever since. Seh Daeng died on Monday morning. The government denied any role in the hit, but then that’s only to be expected, just as the Red Shirts denied any role in the grenade attacks on Silom after the military pitched up there. The government is calling the Reds “terrorists”, yet the death toll is overwhelmingly in favour of the army. The Reds claim to be unarmed, yet rockets have been fired on the Dusit Thani Hotel, which it is alleged was housing soldiers. 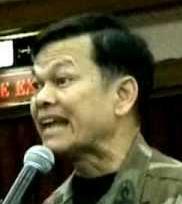 The military has told of “Red Shirt supporters in army uniforms” killing innocents. The spin on both sides is as undeniable as it is unbelievable. As I type this, the UDD has agreed to mediated truce talks and is waiting for a response from Abhisit. It sounds hopeful, but then we have been to the brink of peace before only for matters to escalate time and time again. People have batted the words “civil war” about almost as long as this protest has been running. Until last weekend, such talk sounded alarmist. A month ago, when I visited the UDD’s main stage at Ratchaprasong, it sounded wildly improbable, given that the Reds were engaged in activities no more threatening than singing, dancing, sleeping, eating barbecue and smiling for photos with tourists under a huge English-language banner proclaiming “Welcome to Thailand! All we want is democracy!”. Now, with buildings and vehicles burning, sharpened bamboo canes and barbed wire sealing off major roads, designated live firing zones, dozens of deaths and hundreds of injuries, civil war no longer looks unrealistic. I can only hope that I’m wrong. I have no doubt that civil war will NOT prevail, purely because of the numbers of protesters, and how violent the protests have turned. Lots of people are very angry with the state, It would not be a civil war, but an attempt at genocide of the lower class citizens, this would not be aloud by the UN and countries like the US would be pressured into acting. However, being the US, they would join the Thai army and try to take back the country with less extreme means, instead of doing the right thing and help to overthrow the dictatorship. Peace.